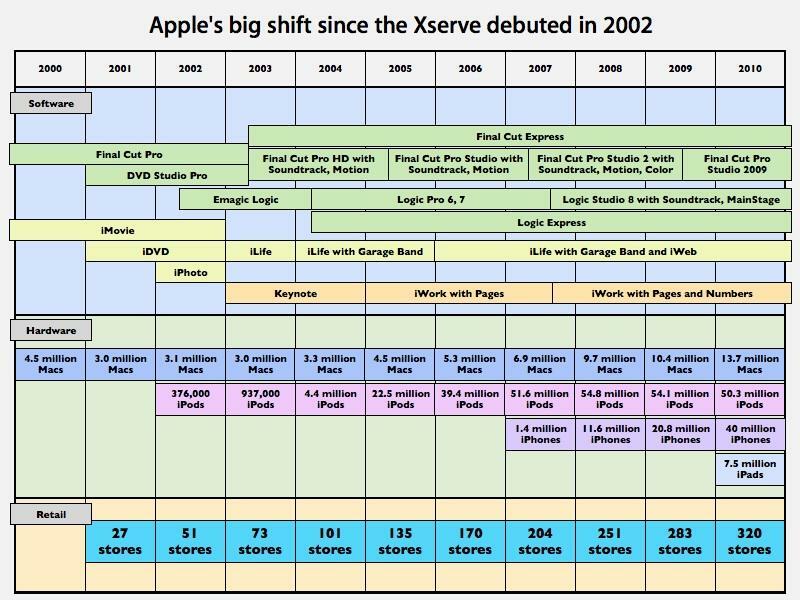 Apple was a very different company when it launched the Xserve in 2002. It had just started to recover from its mid-90s brush with death, only to be hit hard by the bursting of the dotcom bubble in 2001, a shock that aborted the high priced, stylish Power Mac G4 Cube and sent the company scrambling back into its defensive bunker to create products that would reliably sell. The company had been investing in a variety of potential new revenue engines to keep itself afloat. It had just started a new push in application software with the purchase of Final Cut from Macromedia in 1997, which quickly snowballed into a series of Pro Apps and what would turn into the iLife suite and later help spawn iWorks. It had also just ventured into a new retail initiative, opening its first two stores in May 2001. Apple also launched the iPod in October 2001 as its first major foray into personal electronics products outside the definition of "computers and peripherals." At the same time, the company was investing heavily in notebook development, having just launched the new Titanium G4 PowerBook at the beginning of 2001, and was now floating the Xserve its first dedicated server hardware since discontinuing the Apple Workgroup Server in 1998. At the center of each of these efforts was Apple's combination of existing goodwill and established markets around the Mac, and the NeXT software the company had acquired along with the return of its founder, Steve Jobs. The epicenter of Apple was Mac OS X, a product it still wasn't ready to sell as its mainstream operating system until 2002. 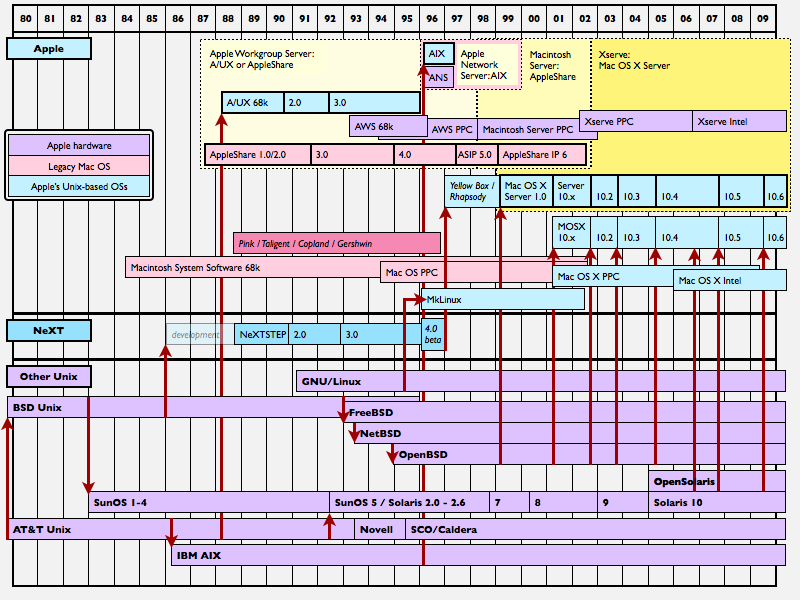 In the meantime, Apple worked to sell consumer hardware running the classic Mac OS 8 and 9. But major Mac developers fought the company over its original plans to migrate from classic Mac APIs to an entirely new development platform based on NeXTSTEP, called YellowBox and then later Cocoa (named to associate it with the existing hype around Java). That forced Apple to repeatedly delay Mac OS X on the consumer desktop until it could fold in enough compatibility with the old Mac OS to enable existing software to run comfortably. NeXTSTEP also needed to be updated to serve the needs of consumers, as under Jobs' former company it had morphed into a niche role as a higher-end workstation and server solution. It appeared that the fastest route to market for Mac OS X was to sell it as a server operating system, which Apple had been doing since 1999. By 2002, Apple was ready to release the Xserve as a dedicated hardware product aimed at broadening the installed base of the new operating system as an easy to use distribution of Unix. Three months after the release of Xserve, Mac OS X for the desktop had finally worked its way from early adopter betas into being a mainstream OS for consumers with the release of Mac OS X 10.2 Jaguar. Apple likely didn't expect to sell that many Xserves, but it didn't need to sell a lot to expand its installed base into strategically important directions. It was currently selling between 750,000 and 810,000 Macs per quarter. Having just announced Mac OS X to be its official, primary OS at the beginning of 2002, the company said it expected to have an installed base of 5 million Mac OS X users by the end of the year. Having a server product in place to support those new Mac OS X clients was critically important, particularly because Mac OS X was still emerging as a suitable file print services client for Windows-based servers and had some issues with generic Unix file servers as well. Companies running a Windows server infrastructure with Mac OS X and legacy Mac OS clients often found it easier to set up a dedicated Mac OS X Server rather than messing around with Microsoft's archaic "Services for Macintosh" or other third party server software capable of serving file shares in the Mac's native Apple Filing Protocol. And so, when Xserve appeared it existed as a new product category for the expanding Apple, one that promised a significant new potential for growth, particularly in Apple's core education market. While the costs for developing Xserve were significant, there were few opportunity costs spent on it; the company didn't have anything else offering better sales prospects to spend its money on. From 2002-2006, Apple's consumer Mac sales began to gain traction but were overshadowed by the dramatic explosion of iPod and iTunes. While pundits continued to bet that Microsoft and its Windows Media / PlaysForSure program would at some point steal Apple's iPod business, that never happened. Their parallel, contradictory guess/advice/wishful thinking that the success of iPod would cause Apple to scuttle Mac OS X and begin selling Windows-based Macs was also wrong. Instead, iPod sales continued to grew exponentially. Thanks to the parallel growth of the new Apple Stores in retailing the hot gadgets, Macs hardware sales also began to grow, leaping from a baseline around 750,000 per quarter to 1.6 million per quarter by the end of 2006. While Apple continued to develop new Mac OS X Server hardware as a way to broaden the installed base of Mac OS X users, it also began a new project to develop mobile devices running a slimmed down version of Mac OS X. This time, rather than trying to woo existing Mac developers with a "does it all" platform that supported native Unix apps, legacy Carbon apps, cross platform Java apps, Apple's own Cocoa apps, and supported a variety of third party platforms such as Flash, Apple set out to build a mobile platform with a clean, modern development API built exclusively upon Cocoa. On page 2 of 3: iOS Explosion, Who was using the Xserve?